Located in Tochigi-ken (ken = state), Nikko Circuit is a small local track used for all forms of motorsports. 1.035km / 0.643mi long. 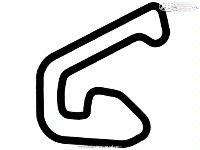 Tochigi-ken is home to many Automobile makers and hosts a variety of testing tracks, Twin Ring, Motegi Circuit, Subaru test course, Bridgestone Kuroiso test course, Honda R&D centre, etc, etc. 1.1 Update includes wet track and raining track. Raining is experimental. It is in no way an attempt to simulate rain, at this stage it is just there to give you the feeling of rain. There are currently no setups for Nikko Circuit. Add a Setup. I'm doing my own private racing series to waist time and Nikko Circuit is the finale for the Japanese and indo-Asia Formulas. A new mediafire link for a competed V1.1 is now up, please try again. A reupload of V1.0 would be nice. thats why 1.1 doesn't work. alright, this one is better....2.9, still not a 3 but keep it up. Really good track for both time attack and drifting. Nice details and nice fps with many veh. Great track!! Thanks for the work and please make ebisu! Great track. This what I was looking for some time. A small track where somebody can learn to race. Also great for cars like 2CV. Not only the layout is good, the track also looks very good.